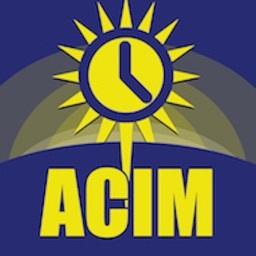 ACIM Remind by CDE Solutions Inc. 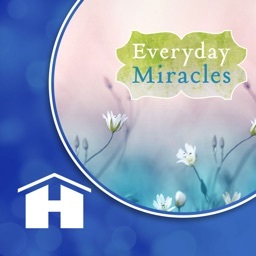 The FOUNDATION FOR INNER PEACE, original publisher of "A Course in Miracles," has joined with CDE Solutions to produce this app as an aid to those working on their daily lessons from the Workbook of the Course. 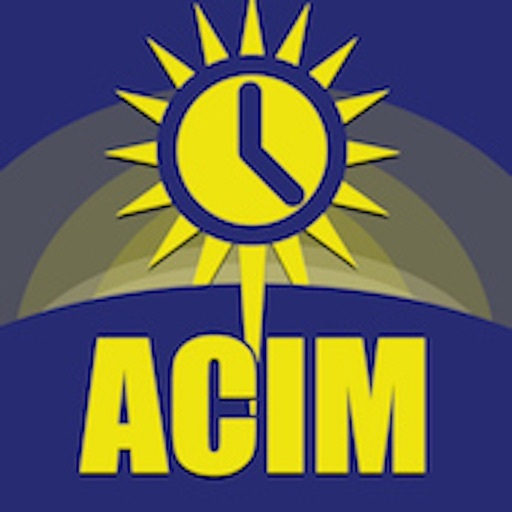 -- As a student of the Course have you ever spent time studying your lesson in the morning only to forget to review it at the suggested time intervals during the day? Have you ever wished that you had reminders, preset at the required time intervals, to jog your memory? Have you ever remembered to review a lesson but forgot what words to use? 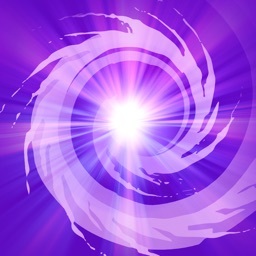 If so, then this app is for you! 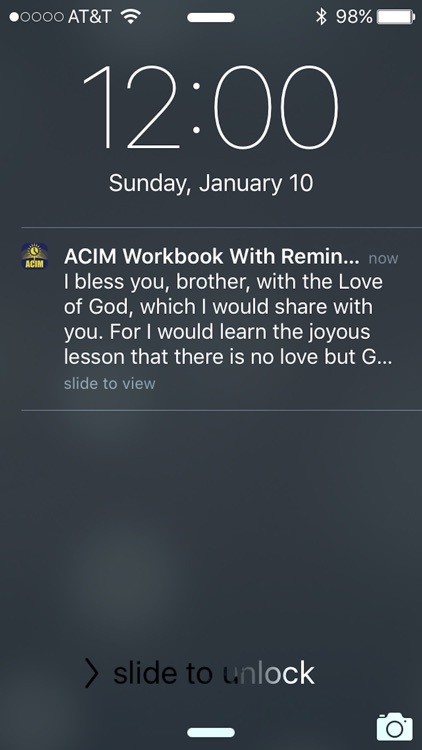 In addition to providing convenient access to the full text of the 365 daily lessons from the Course's "Workbook for Students," THIS APP HAS BUILT-IN REMINDER ALERTS which have been preset with specific text to be remembered for the day and the time intervals as suggested within the lessons of the Workbook. 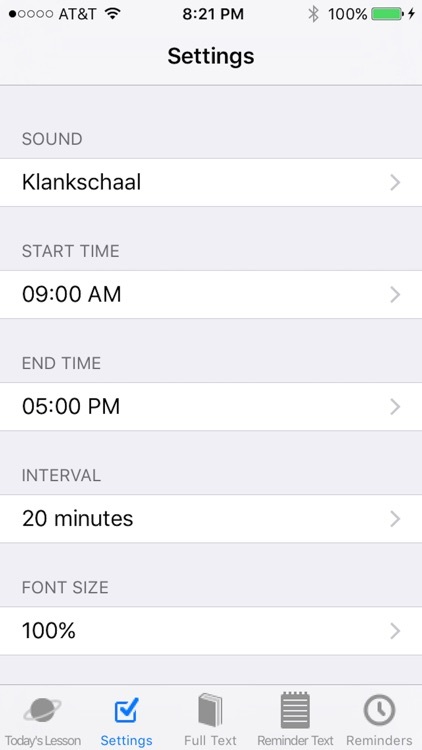 For lessons that have no suggested time intervals, you can select a time interval of your choice. You can even override Course specified intervals to time intervals of your choice that fit in with your daily schedule. The app is simple to use. To begin you would select the lesson you are currently working on from a rotating "wheel," then when the wheel stops on your lesson of the day you click on "Full Text" and you are presented with the full text of the lesson. Once your beginning lesson has been selected you will be presented with the same lesson when you return the next day. This allows you review the previous lesson, or move on to your daily lesson. The complete Workbook, including Introductions, can be accessed from the wheel. During the day, shortened text (the words suggested within the Workbook lesson to be used as the reminder that day) is presented when the reminder alert is sounded. These words can be changed to whatever words you would prefer to use instead. In addition, you can choose what sound you’d like to hear as a reminder, when you want the reminder to start, and when you want it to end. You purchase the app ONLY ONCE for all devices. The Course’s teaching is based on the practice of forgiveness as the key to inner peace and the remembrance of God. 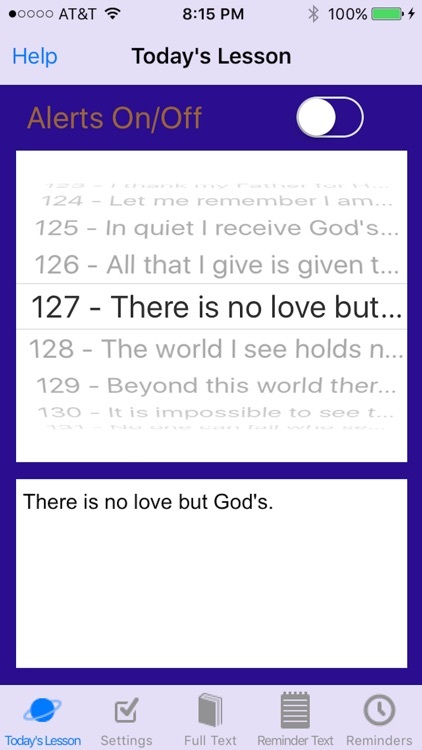 While the app contains the text of the complete "Workbook for Students", it represents only part of the Course, a unique self-study metaphysical thought system. 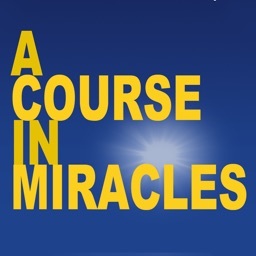 Published in one volume, "A Course in Miracles" consists of three separate sections: "Text", "Workbook for Students" and the "Manual for Teachers". The "Text" section of the Course sets forth the theoretical concepts of the Course's thought system and thus provides the necessary framework to clarify the meaning of the "Workbook" exercises. 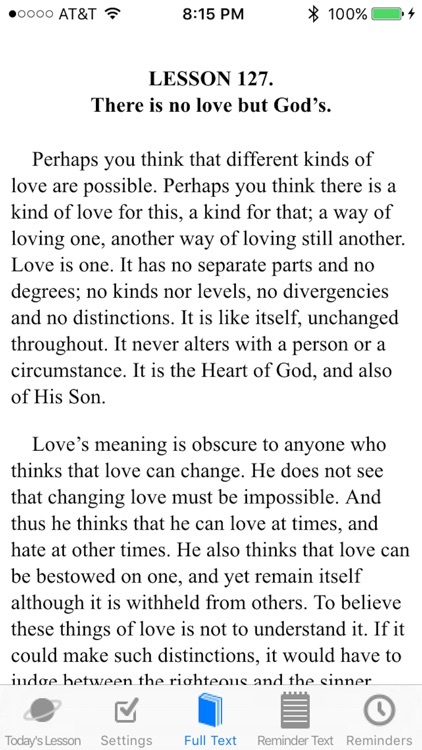 It is therefore important to undertake the lessons in this app in conjunction with the writings within "A Course in Miracles". "A Course in Miracles" was received in its entirety over a period of seven years by psychologist Dr. Helen Schucman through an inspired process she described as scribing. 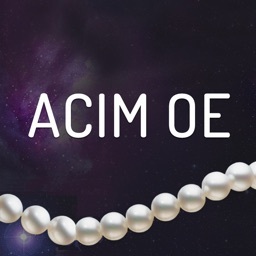 In 1975 the Foundation for Inner Peace, co-publisher of this app, was chosen by Dr. Schucman to be the publisher of the only original edition of "A Course in Miracles". 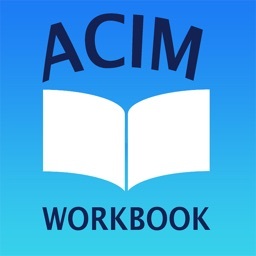 The "Workbook for Students", contained in this app, includes 365 lessons which are designed to train your mind in a systematic way to a different perception of everyone and everything in the world. As stated in the Introduction to the Workbook: “The exercises are very simple. They do not require a great deal of time, and it does not matter where you do them. They need no preparation.” You are asked only not to undertake to do more than one exercise a day. You might however choose to remain with a particularly appealing lesson for more than one day.